"I had a problem with those apocalyptic covers," graphic and web designer Gustavo Sazes told Noisecreep. "I simply don't like doing a remake of a 'Mad Max' meets 'Escape from N.Y.' scene, so sometimes I have to say no to tons of bands who wants me to do that. But with HD it was really different. I said yes." 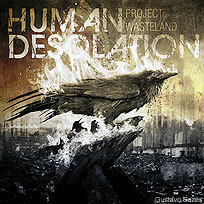 Hailing from Stockholm, Sweden, Human Desolation release their first album proper in 'Project Wasteland' -- their first release being a demo from 2008. Under the Abstrata design moniker, Sazes adds one more project to the countless numbers he has finished, which include clients like Manowar, Arch Enemy and God Forbid. "I felt it was time to fight my inner demons and do a 'this is the end of the world' type of cover, but in a very personal way," Sazes explained further about the meaning of the album art. "I really think this cover looks like 'the end' for sure. The mother bird frozen in time while [her] children are being consumed by the flames, it's like humanity's coldness transferred to animals: no sense of protection, just like shut up your mouth and die! I feel like it was the last life tie to be broken and consumed."